Most new affiliate marketers getting into the business do what I call hit and run affiliate marketing. It’s the model they’re all familiar with because it’s the one they hear about the most. The hit and run marketing steps goes something like this. I’m sure you’ve all heard stories of affiliate marketers spending $10K a day to make $20K? It sounds great doesn’t it? The only problem is there are not many affiliate marketers who can do that. Also, those who are making a profit using the hit and run model are leaving a ton of money on the table. Spending money on advertising to get one customer that you will never see again is one of the dumbest business move you can make. That’s like Best Buy spending $50K on a front page ad on the Wall Street Journal to have those customers buy one item and then never visit the store again. They’re go under in less than six months if that’s the case! Another problem with the hit and run model is it’s not very stable. You have to keep spending money on advertising or the sales stop. You risk the chance of Google slapping your landing page because of a low quality score, you may run out of money tweaking the ads/keywords/landing pages, competition can drive up bids to the point where you can’t make a profit, the advertiser may pull the offer, etc. Too many people think of Internet marketing as a game. It’s not. It’s a real business and real businesses are built on repeat customers. A restaurant can’t survive with first time customers only. The Apple Store, or any retail store, would go under in a few months if their customers visit the store once and never visit again. If someone buys one Apple product, then he is likely to buy another product from Apple. The same thing holds true for affiliate marketing. If someone buys a Clickbank product from you, he is likely to buy another one. But that will never happen if all you do is hit and run marketing because you’ll never see that person again. My Clickbank business model is more complex than the hit and run model. It will require more work on your part but unlike the the hit and run model, you will make way more money with it. Here are the steps. When Shoe launched Shoemoney System on Clickbank, he built a prelaunch list of over 100,000 names. While Shoe did well with his system, that list he built is worth an extra $1 million a year in additional revenue because he’ll be able to use the list to promote other related products. If you want to become a big Clickbank affiliate marketer (or blogger), you absolutely need an email list. That is your customer base. Without one, you’ll just be another hit and run affiliate marketer working for peanuts. Stop building other people’s customer base and start building your own. The first step to making money from Clickbank is to decide on the niche you want to target. Ideally, the niche should be a niche that you have a knowledge of and a passion for. If that’s not the case, then you can still make money with it but you wouldn’t have as much fun and to me, having fun is even more important than making the money. The free eBook doesn’t have to be very big, 20 to 60 pages should do, but it does need to cover the same niche as the Clickbank products you plan to promote. This is why I said you should have a knowledge of the niche you plan to deal in. A squeeze page is a special kind of landing page that is created solely to act as an opt in for information â€“ primarily email addresses â€“ from potential subscribers. When people visit my blog, I want them to subscribe to my email list. However, because there is so much to see and read, the number of sign ups isn’t as high as it could be. By creating a separate squeeze page, the email sign up rate can skyrocket. While I can capture maybe 5% of people visiting my blog, I have seen squeeze pages with conversion rate has high as 60%! The above screen shot is the squeeze page Jonathan Volk used to capture emails. 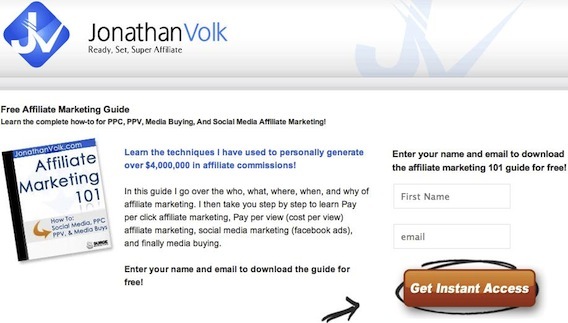 By offering his Affiliate Marketing 101 guide for free, Jonathan was able to get 50% of the people visiting that page to opt into his email list. The easiest way to create a squeeze page is with Squeeze Theme by Unique Blog Designs. Squeeze Theme is powered by WordPress and will allow you to create custom squeeze pages in minutes. Jonathan and I both use Squeeze Theme to create all our squeeze pages. To use Squeeze Theme, all you need to do is choose the theme you want to run, add the text, photo or video, your Aweber email codes and let Squeeze Theme do the rest. Before Squeeze Theme came along, I had a designer do all my squeeze pages. Now, Squeeze Theme does it for me in just a few minutes. Once the squeeze page has been created, you need to send traffic to it. The quickest way to do that is to use pay per click or pay per view advertising. However, that’s also the most expensive way. There are tons of lower cost or free methods for traffic generation. A little creatively can go a long way. While a squeeze page maybe the best way to get someone to give you his email address, you still need a system to handle and host the list. My recommended email service is Aweber. I’ve been using them for years and they are by far the best in the business. Aweber works seamlessly with Squeeze Theme and its web interface allows you to access it from any computer, anywhere in the world. Auto responders are emails that go out at a set date and interval. When someone subscribe to my blog, they are sent a series of auto responder emails. These emails are design to do three things. Setting up the auto responder is extremely easy and is no different than sending out a normal email. If you’re using Aweber, all you have to do is click “Follow Up” in the Message tab. 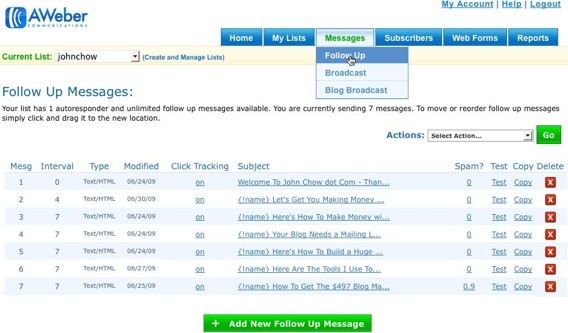 This will allow you to create a follow up message to be sent to your new subscriber at a later date. 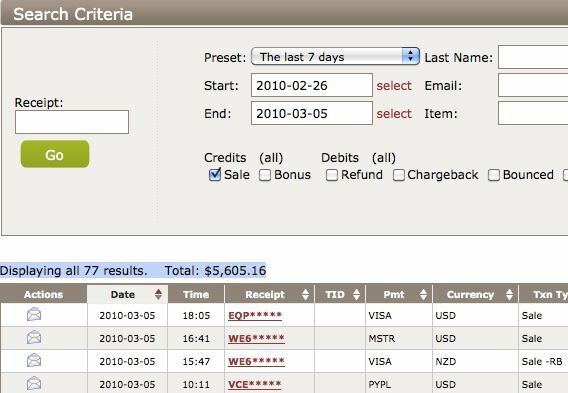 Aweber allows you to set up an unlimited number of auto responders. If you check the screen shot above, you’ll see that my first auto responder email goes out the instant someone signs up to my list. The second follow up email out goes out four days after the first and the rest goes out in one week intervals until there are no more follow ups.